unigrow-2 | Big Dutchman, Inc. 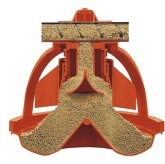 The feed collar is lowered to a preset height for the appropriate feed level. Adjustment of the pan’s drop allows for eight different minimum.